Menopause is a natural transition that women typically go through in their 40's and 50's. When a woman doesn't have a menstrual period for at least one year, she is considered to have reached menopause. This transition in a woman's life marks the end of her fertility, and can cause menopause symptoms such as hot flashes, vaginal dryness, and mood changes. However, many women find menopause comes as a relief, because they no longer need to worry about being pregnant and can enjoy a new stage in their life. Menopause is usually caused by a natural decrease in the production estrogen and progesterone, which are hormones produced by the ovaries. However, menopause can also be induced by some types of hysterectomies, which is the removal of the uterus and/or ovaries. Chemotherapy and radiation therapy, two forms of cancer treatments, can also induce menopause although it is not always permanent. Also, a condition called primary ovarian insufficiency can induce menopause because it happens when the ovaries do not produce enough hormones. Premenopause. This is the reproductive stage, the time before menopause or any of its symptoms appear. Perimenopause. This stage usually lasts at least 2-10 years before menopause. 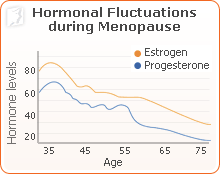 It is when the level of hormones in a woman's body begins decreasing and when most women experience the bulk of menopausal symptoms. Menopause. A woman has reached menopause when she has spent one year without a menstrual period. Menopause symptoms may still affect a woman during this time. Postmenopause. This is the final stage, when menopause has passed and its symptoms usually subside. What Are the Different Types of Menopause Symptoms? Symptoms of menopause can impact a woman's quality of life, so it's important to seek treatment if you need it. Talking to a doctor is always useful in learning more about effectively coping with menopausal symptoms. Itching skin. Skin may also become drier or oilier and fine lines may appear more prominent. Electric shocks. Many women experience a sensation similar to ants crawling over their skin. Hair loss. Some hair loss and thinning is normal during this stage of life. Weight gain. Hormonal changes can lead to weight gain and change the distribution of fat.